Pending home sales, an important leading indicator for activity in the housing market rose 0.5% MoM in December, in line with expectations. The increase over the past three months compared to the previous three months rose to 2.6%. This indicates sales of existing homes are likely to start the year on the front foot in January, though the extremely cold weather in the first part of the month may have hampered activity somewhat. After a solid performance in 2017, we expect the US housing market to remain in robust health in 2018. 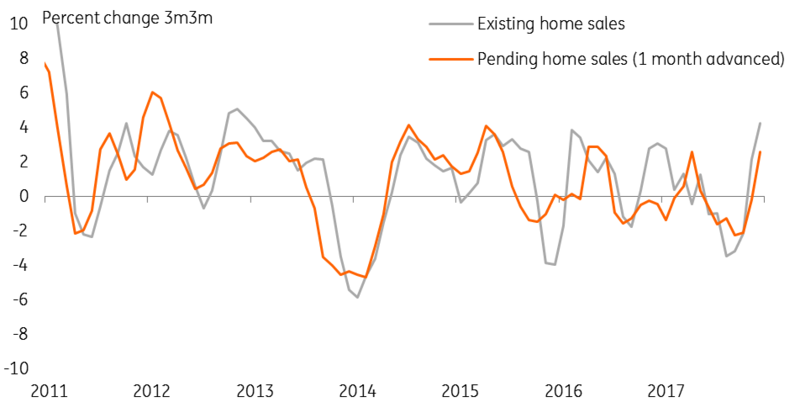 Strong momentum in the economy, increasing employment and rising household income will provide a tailwind for sales volumes and prices. Rising prices and record tight supply are also likely to spur increased construction of new homes, which in turn will support economic growth. That said, there are a couple of factors that will hold the housing market back this year. The administration's changes to the tax code (reducing the tax deduction available for mortgagors) could put a dent in some high-priced markets. More worryingly, mortgage rates have started to rise as the long-end of the curve has repriced sharply in January. Effective rates on 30-year mortgage rates have risen by 25bp over the first three weeks of 2018 to 4.58%. Given that affordability is already fairly stretched for the average household, should this trend continue it would put more significant pressure on house prices.